Scarlett flirts with her beaux. 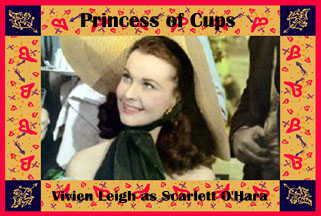 The Princess of Cups is a femme fatale, using her charm and sexuality to manipulate men into giving her what she wants. You cannot trust what this person says because she does not speak out of truth. Her words and gestures are carefully chosen to accomplish her goals. Scarlett was teased away from Terry and Christine's Homepage.